Muhammad Ali vs George Foreman Battle in the "Rumble in the Jungle"
The Rumble in the Jungle was a historic boxing event that took place on 30 October 1974, in the Mai 20 Stadium in Kinshasa, Zaire (now Democratic Republic of the Congo). It pitted then world Heavyweight champion George Foreman against former world champion and challenger Muhammad Ali. The event was one of Don King's first ventures as a professional boxing promoter. He managed to get both Ali and Foreman to sign separate contracts saying they would fight for him if he could get $5 million to be their pay. However, King did not have the money. So he began looking for an outside country to sponsor the event. Zaire's flamboyant president Mobutu Sésé Seko asked for the fight to be held in his country, eager for the publicity such a high-profile event would bring. King had pulled together a consortium that included a Panamanian company called Risnelia Investment, the Hemdale Film Corporation, a British company founded by film producer John Daly and the actor David Hemmings, Video Techniques Incorporated of New York and Don King Productions. Although King is most closely associated with the fight it is Hemdale and Video Techniques Inc., with whom King was a director, who were the official co-promoters of the fight. Ali started the first round attacking Foreman with the unconventional (and provocative) 'right-hand leads'. 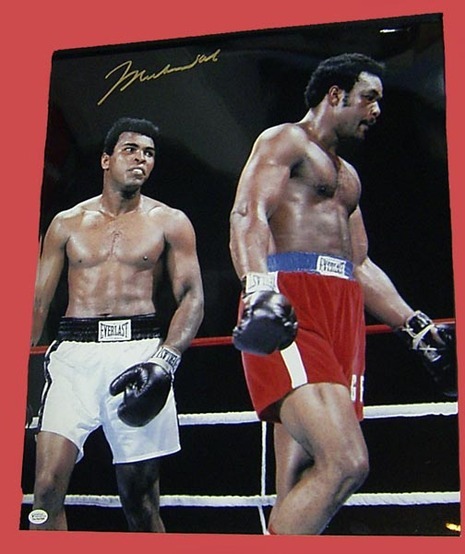 This was notable, as Ali was famed for his speed and technical skills, while Foreman's raw power was his greatest strength; close range fighting would, it seemed, inevitably favour Foreman and leave too great a chance that Ali would be stunned by one or more of Foreman's powerful haymakers. Ali made use of the right-hand lead punch (striking with the right hand without setting up with the left) in a further effort to disorient Foreman. However, while this aggressive tactic may have surprised Foreman and it did allow Ali to hit him solidly a number of times, it failed to significantly hurt him. Before the end of the first round, Foreman caught up to Ali and began landing a few punches of his own. Foreman had also been trained to cut off the ring, preventing escape. Ali realized that he would tire if Foreman could keep making one step to Ali's two, so he changed tactics. Ali had told his trainer, Angelo Dundee, and his fans that he had a secret plan for Foreman. Almost right away in the second round, Ali started lying on the ropes and letting Foreman punch him, without any attempt to attack Foreman himself (a strategy Ali later dubbed the rope-a-dope). As a result Foreman spent all his energy throwing punches, that either did not hit Ali or were deflected in a way that made it difficult for Foreman to hit Ali's head, while sapping Foreman's strength due to the large number of punches thrown by the champion. 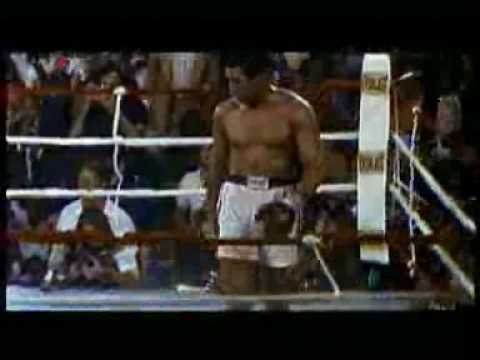 This loss of energy was the key to Ali's "rope-a-dope" technique. Ali seemed to do little to resist, except to occasionally shoot straight punches to the face of Foreman. (This quickly began taking a toll on Foreman's face and it was soon visibly puffy.) When the two fighters were locked in clinches, however, Ali consistently outwrestled Foreman, using tactics such as leaning on Foreman to make Foreman support Ali's weight, or holding down Foreman's head by pushing on his neck. The latter move is disorienting and can heighten the effect of punches, since it causes a greater snap in the neck when a fighter is hit in the head and therefore increases the chances of a knockout. Ali also constantly taunted Foreman in these clinches, telling Foreman to throw more and harder punches, and an enraged Foreman responded by doing just that. After several rounds, this caused Foreman to begin tiring. As Foreman's face became increasingly damaged by the occasional hard and fast jabs and crosses that Ali threw, his stamina looked to be draining from him. 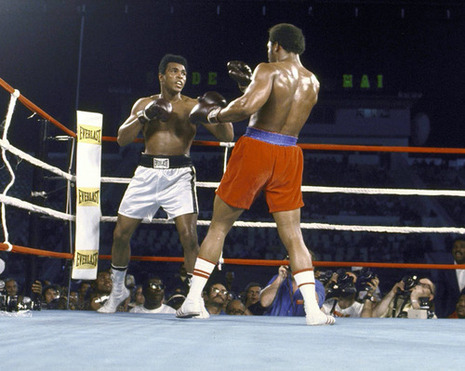 The effects were increasingly visible as Foreman was staggered by an Ali combination at the start of the fourth round and again several times near the end of the fifth, after Foreman had seemed to dominate much of that round. Although he would keep throwing punches and coming forward, after the fifth round Foreman was very tired and he looked increasingly worn out. Ali continued to taunt him by saying "they told me you could punch, George!" and "they told me you could punch as hard as Joe Louis." Finally in the eighth round, Ali landed the final combination, a left hook that brought Foreman's head up into position so Ali could smash him with a hard right straight to the face. Foreman staggered, then twirled across half the ring before landing on his back; he finally managed to get up, but it was too late. Some argue this to have been among the greatest demonstrations of strategic planning and actual execution ever displayed in a heavyweight fight. Ali came into the fight with a tactical plan, executed it and achieved a great triumph. The fight made clear just how great Ali was at taking a punch and also highlights the different, perhaps dangerous, change that Ali had made in his fighting style, by adopting the rope-a-dope, instead of his former style that emphasized movement. While the style change may have been necessitated due to Ali's age and ring inactivity in the late 1960s, film of the Zaire fight shows Foreman striking Ali with hundreds of thunderous blows, many blocked but some getting through, mostly to the sides and kidney region. Foreman managed to land a couple also to the head, but seemingly with no effect. This fight has since become one of the most famous fights of all time because it resulted in Ali, against the odds, regaining the title against a younger and stronger Foreman. It is shown several times annually on the ESPN Classic network. After this fight Ali once again told the world he was the greatest. Venue: 20th May Stadium, Kinshasa, Zaire. 30th October, 1974. Muhammad Ali was a major underdog, boxingfaded prince at 32 years of age. Many boxing commentators felt that Ali had reached the end of the road. Between Ali and the title was a bigger, younger and stronger man, who had never lost and had knocked out 37 of his 40 opponents. His laste eight fights had all ended inside six minutes. Foreman had destroyed Joe Frazier and Ken Norton, the two men who had beaten Muhammad Ali. He was surely unbeatable in the same way that Sonny Liston had been. This was the great promotion by Don King who had managed to raise a purse of $10 million (to be split equally) from the president of Zaire, Joseph Mobutu. Mobutu was a dictator who ruled his country through fear. Muhammad Ali soon settled into Africa. He was recognised even in the remotest parts of the country. He soon learned the phrase that became his mantra, "Ali Boma Ye" wich translated into "Ali Kill Him." Foreman, surly and uncommunitive soon lost the PR battle. Just as Ali had painted Frazier as the outsider in his own land, he did the same to Foreman in Africa. Very quickly Ali had the whole country behind him. Then eight days before the fight, Foreman's sparring partner Bill Murray accidentally caught him with an elbow and cut him over his right eye. THe bout was off. The fight would be postponed for almost five weeks and everyone would remain in Zaire while Foreman healed. This of course gave Ali the chance to work his mind games on his opponent. With a captive press corps, he characterized Foreman as the Mummy, and mocked his straight up and down style. Ali claimed he would dance rings around Foreman when fight night came. The weather before the fight was oppressive as the rainy season was fast approaching. The ropes of the ring would stretch in the heat and the songe mat softened and would be harder for Ali to move about. The mood in Ali's camp darkened. The fighters entered the ring at four in the morning, to allow the satellite feeds to the US to be shown Prime Time. The attendance was 60,000 although Mobutu would watch on TV from his compound for fear of assassination. At the opening bell, Ali seized the initiative with an audatious attack. He rushed at Foreman and landed a hard right hand. Then he hit Foreman with punches that confounded the champion. Then Ali went to the ropes and allowed Foreman to hit him. Even Angelo Dundee was unaware of Ali's plan. In between rounds one and two Ali would lead the crowds in chants of "Ali Boma Ye!" He spent the entire second round leaning on the ropes, which by now were very slack. Ali swung back into the ropes to ride Foreman's punches absorbing a lot of them on his arms and gloves. WHen the round was over Dundee shouted at Ali to start dancing. In the third round Ali ignored Dundee's advice and continued his rope-a-dope tactic. As Foreman continued to hit him, Ali began to taunt him "Is that all you got, George? You disappoint me. My Grandma punches harder than you do... you supposed to be bad..." After two more rounds, Ali's strategy was becoming clear. In the hot night, FOreman sucjed at the heavy air. Ali continued to instruct Foreman to hit him harder. Then he opened up his gloves and said, "George, now its my turn," and unleashed some dizzying shots of his own. Slumped on his stool after the bell, Foreman was attended by worrying men. Foreman had not had to fight for more than six minutes for a long time. In contrast, Ali had hardly bothered to sit down. "I'll get him in a couple of rounds," he told Dundee. For rounds six and seven, Ali continued to absorb punches, but landed more of his own. Foreman's swings began desperate. In the eighth, Ali's moment came, as he knew it would. Foreman aimed one last slug and staggered forward with the momentum of it. Ali sprang from the ropes, landing two beautifully timed straight right hands, a concussive left hook and a last perfect right hand. Foreman flapped at him and then fell in a slow pirouette. As the count reached 10 he could only half stand and the fight was over. In seconds the ring was full and Ali engulfed. He had beaten the unbeatable for the second time in his career and reclaimed boxing's greatest prize. Within an hour of the end of the fight the heavens opened and the stadium was flooded. This was to be Don King's first venture into boxing promotion. He guaranteed both fighters a then unheard of $5 million each; money which he didn't have. As a result, he looked for a country other than the USA who were willing to sponsor the fight and take this massive burden off him. The president of Zaire was interested, and the stage was set - the two fighters were to battle it out in Kinhasa, Zaire. At this time, while the heavyweight division was stacked, these two stood out as the top contenders. Ali was coming off a unanimous decision win over Joe Frazier and Foreman was considered to be an absolute wrecking machine. Going into this fight, he had amassed a 40-0 record, with 37 of those wins coming by way of knockout. People realised Foreman was for real when he obliterated 'Smokin' Joe Frazier in two rounds, knocking him down six times in the process. Also, in the fight previous to his encounter with Ali, he destroyed Ken Norton, a very respectable heavyweight in two rounds. While the public wanted Ali to win, many people thought Foreman would be too much for him. The opening round was the most tentative of the fight for both men. However, Ali did well, utilising his speed and jabbing from the outside well. Foreman managed a few decent body shots at the end of the round, but this belonged to Ali. The second session probably went Foreman's way though. Ali was starting to use the infamous 'rope-a-dope' tactic, but at this stage, Foreman was outworking him, and throwing some really good hooks to the body. Foreman carried on his excellent body work in the fourth, but he probably lost this round as Ali had now woken up. Ali opened up with some head shots, including a very tasty left hook which rocked Foreman. The legs of Foreman seemed tired in the fourth, probably because of the immense heat in Zaire. However, he put a big effort into this round, and nicked it with more body work. In the fifth though, Ali confused Foreman to no end. 'Rope-a-dope' was working beautifully, and Foreman was looking exhausted. Ali couldn't get careless though as Foreman was naturally heavy handed, and his corner grilled him for staying on the ropes at the end of the round. Foreman was so tired in the sixth that even when he had Ali against the ropes he couldn't do any serious damage. Ali's fantastic speed was telling now, and it was starting to become apparent that Foreman was really slowing down. To his credit though, Foreman took the seventh on workrate alone. He dug down deep, and while he didn't have an amazing round, Ali did very little, basically giving the round to his foe. The eighth was to be the last round of the fight. Foreman dominated this round, punishing Ali brutally on the ropes. However, he punched himself out, and when Ali managed to get off the ropes, he unleashed a combination of the head of Foreman which put him down. Foreman got up, but couldn't beat the ten count, and Muhammad Ali was crowned the WBC and WBA Heavyweight Champion of the world.